Hello everyone! We’ll be updating this all weekend with coverage of the World Championship, mainly focusing on what we see in the top Modern and Standard decks. We may have a few different people in here over the weekend, so keep checking back to see how things develop over the weekend! We’re just now getting into the Modern rounds, so we’ll see how players attack the format. It’s not just about finding powerful decks in Modern, it’s about metagaming against the 23 opponents at the World Championship. With Magic Origins hitting the scene, we’ll see how things develop. Hearing that Affinity and Living End are making up a large percentage of the field. If you’re feeling ambitious, I would keep an eye on Living End staples, which could see a big increase with a strong weekend. Starting at the top, Living End has seen some price movement recently but has settled down a bit to $12. With such a random effect and set-specific mechanic, this is really hard to reprint and could see a strong rise. Next up is Bogles, which always seems to be a popular choice at this event in particular, I suppose because players don’t expect the field to be ready for it. Of course, I just watched Steve Rubin die to Inkmoth Nexus on Turn 4, so that doesn’t do much to speak to Bogles. I’d like to see how this deck performs over the weekend, because it’s done well before without seeing any staying power. Could be a flash in the pan even if it performs strongly. Merfolk winning on camera! This makes me happy. That said, Affinity is basically unwinnable, and Bogles isn’t a ton better, so the fish will be swimming upstream. 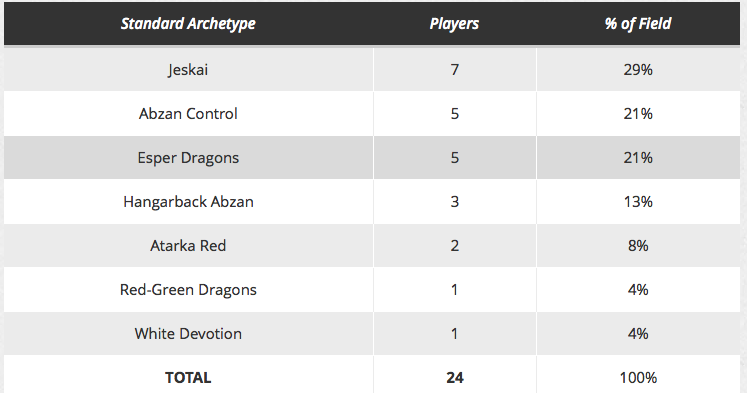 Mixed results for Affinity, which has done better than Bogles so far but fell to Grixis Twin. The real news here is that a Battle for Zendikar spoiler comes next round. HYPE! Lots of Affinity, which makes sense in a format where you only need to play five rounds. Living End is the interesting one, and we’ll see where it goes from here. 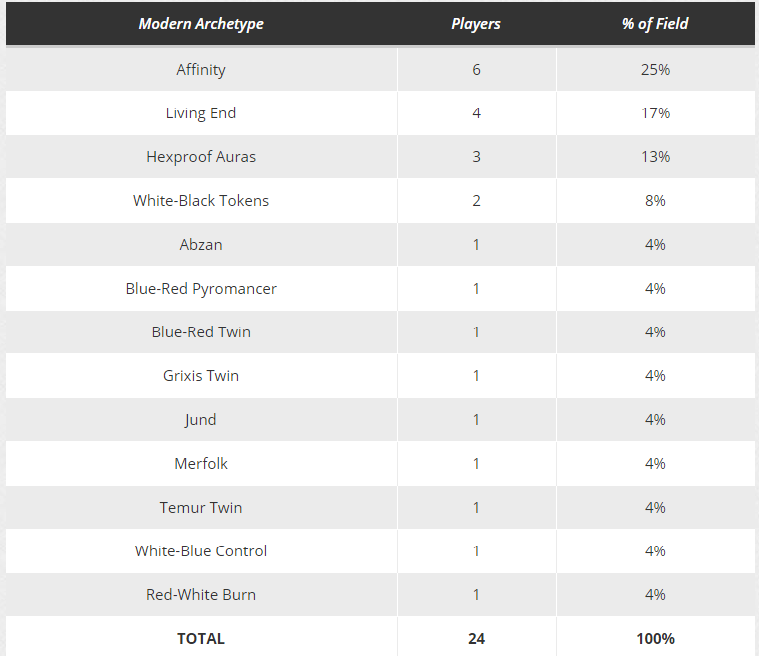 After that there’s not much to see, though two players on White-BlackTokens is notable, as is the number of Young Pyromancers and Spell Snares in the field. Both of those uncommons could room to move in the longer term, so it’s worth keeping an eye on those flying under the radar for sure. Spell Snare again being an all-star on camera, as 4-0 Shaun McClaren describes it as countering “everything.” It’s been steadily climbing to $8 over the past few months, and I would be surprised to see it up to $15 or so by the time we hit next Modern season. If you think you’re going to need these in the future, picking them up now is not a bad idea. Control mirror on camera, with Yuuya Watanabe displaying an interaction I hadn’t seem before. Dragonlord Ojutai plus Minamo, School at Water’s Edge. The Minamo can untap the Ojutai after it’s attacked to give it hexproof again while still attacking. Pretty nutty. Both cards are already expensive though, so I’m not sure there’s much to see here financially. We have a Battle for Zendikar spoiler! 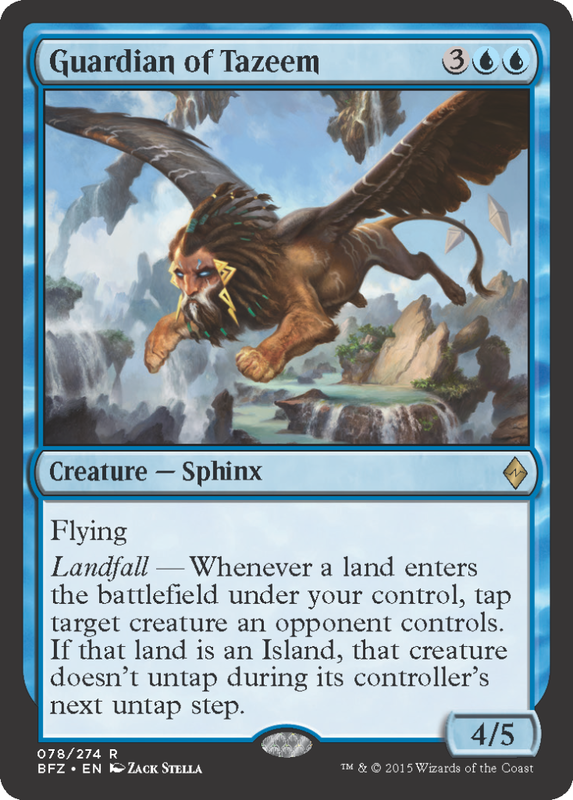 This is a pretty cool twist on Landfall, and while this particular card is a Limited bomb but not likely to be relevant in Constructed, I really like the direction they’re taking Landfall here. Meanwhile, Ghirapur Aether Grid has shown up in Affinity, which seems very good in both the mirror and against the bane of Affinity: Lingering Souls. Nice adaptation, and could be a staple of sideboards going forward. Maindeck Supreme Verdict seems pretty good for Watanabe, but while his Affinity matchup may be okay, his Bogles matchup seems pretty rough. Again, I like these control lists this weekend, but I’m not a huge fan of the Bogles list having any staying power, since they’ve done well at this event before but then fallen off the radar. That’s it for tonight. We saw a lot of Modern decks on Thursday, and it seems that Hangarback Walker and Jace, Vryn’s Prodigy foils have been bought out of the internet. There’s still a few weeks of Origins left, though, so I expect these to settle as players move on from the flavor of the week. Both of these are powerful cards, but these spiked prices won’t hold. Sorry for the delay in updating this everyone! We had coverage being done but it somehow didn’t all make it into here. Looking over Standard, it seems like there’s definitely some things to like. A lot of Jeskai showed up, and Mantis Rider and Soulfire Grand Master are all over the place. Mantis Rider is somehow still available en masse under a dollar despite being a 4-of in these decks. I’ve been on the Mantis train for a while now, and the window could be closing quickly. Grand Master is around $8, but if it sticks around post-rotation it could easily double up given its Mythic status. These decks actually survive Rotation fairly well, and you can be sure that Jace is going to find another home. A lot of things to like in these decks. Looking over the rest of the metagame, it’s basically the usual suspects. The most important thing to consider here is what cards will survive Rotation, and begin to make plays on them accordingly. It’s going to be an exciting Top 4. More importantly, we’re going to be getting a mess of Battle for Zendikar spoilers tonight, and we’ll have all the spoiler coverage live here with Douglas Johnson and Jason Alt. You can see the coverage a day in advance? Also, this has been fixed. I guess you guys just decided to take Friday off??? It’s LIVE COVERAGE … just not posted online. Ha! Then where is the coverage of it’s not online? In their heads? Someone asleep at the wheel? Hey guys, a lot of the coverage went on here (http://blog.mtgprice.com/2015/08/27/battle-for-zendikar-spoiler-coverage/) and didn’t get cross-posted here. Sorry about that! We’ll be back tomorrow with live updates. 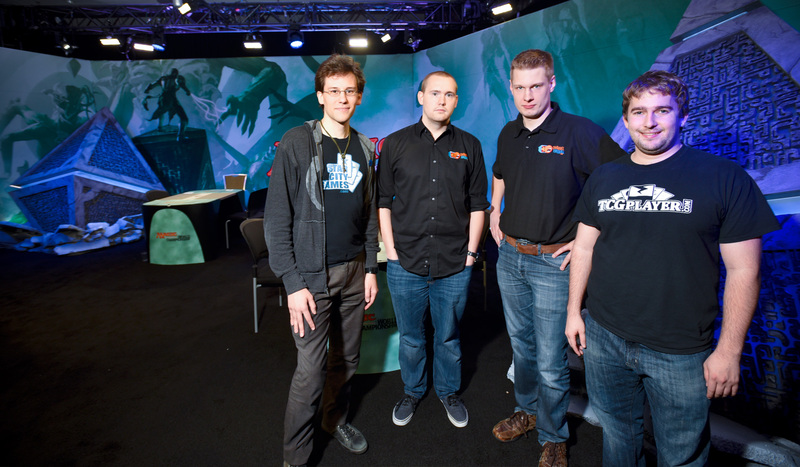 That’s just spoiler coverage for BFZ….no actual coverage of the World championship…. That didn’t happen, at all. You guys really blew it here. I just joined with a protrader account to see if it was worth it about a week or so ago, and there was literally ZERO live coverage of the World Championship after Thursday’s early action. Nothing on Friday until well after the fact, and only a short summary at that. Then Saturday you listed the top 4, for what reason I don’t know. And then nothing today. Not very professional at all.